A continuation of the Luna Series but with one more element and larger than "Jungle Red", "Red Nessie" stems from the concept that we only see that which is on the surface, or above ground. The truth of life is that what we do not see or cannot understand, we imagine. This concept takes the floating, spiraling, serpentine and ribbon-like line of the sculpture that is above ground and lets it be graceful and playful and light. The other half of "Red Nessie", the underground unseen half that is imagined, is solid, heavy and mysterious. The juxtaposition of one half against the other is the intrigue. 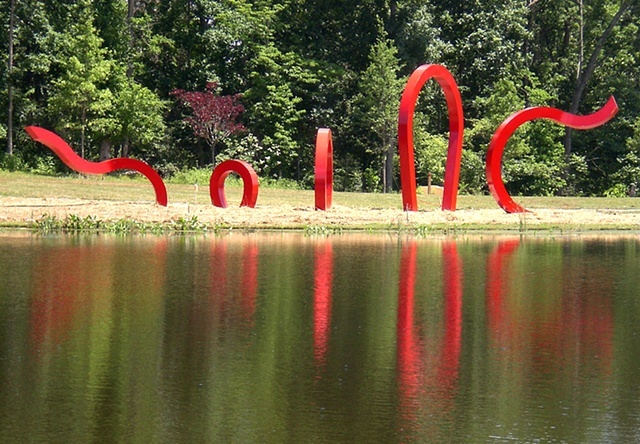 "Red Nessie" is situated on the beautiful grounds of the Janelia Farms Research Campus of the Howard Hughes Medical Institute, which has world class architecture amidst great natural beauty. Delos is very proud to have be represented in this collection. Photo courtesy of Jack Devine.